Sadly, there comes a time when a family member passes away or a decision has to be made about euthanasia for a pet. We are here to help in all those circumstances. During weekdays, we can arrange home visits for euthanasia. We use a reputable pet crematorium afterwards, and ashes can be returned individually for scattering, or in a casket. Some easing of the pain can be gained by discussing and deciding your wishes before a crisis happens e.g. When might we consider euthanasia? Will we want cremation? How do we help the children cope? 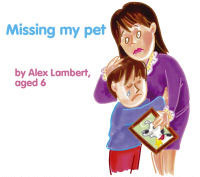 We stock a book that helps younger children to understand and deal with the loss of a pet and there are useful pointers for parents. It is called ‘Missing my Pet’.